Successfully Added Ultra-Thin Aluminum Bluetooth Keyboard for iPhone, iPad, and iPad2 to your Shopping Cart. Even thinner than your iPad, this stylish aluminum Bluetooth comes with a full QWERTY keyboard that seamlessly connects with your iPhone, iPad, or iPad2 for quicker and more comfortable typing. 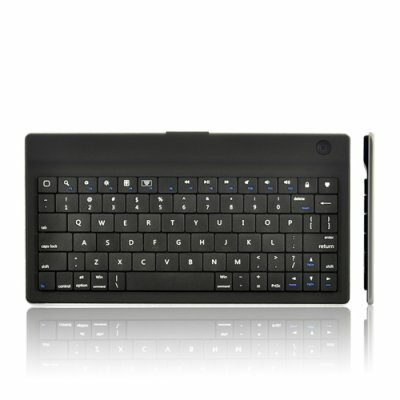 Don’t want to replace your iPad Smart Cover with a keyboard case but need a wireless keyboard? Existing iPad case holder doesn’t have a keyboard? Not a problem anymore. This Ultra-Thin Aluminum Bluetooth Keyboard not only functions as a wireless keyboard for easy typing, its sleek and metallic design perfectly complements your iPad. In addition, it comes with 13 multimedia hotkeys for one-touch control of your iPad. This innovative and durable aluminum Bluetooth Keyboard is ideal for people who regularly use their iPad or iPhone in any environment for e-mailing, making notes, and writing documents. It can also be used with PC or MAC with Bluetooth functions. Apple accessories always sell well online. List this product on your resale store or eBay listing page to offer your customers one more choice and make some extra profits. Click "Add to Cart" now, and Chinavasion - your reliable source of electronic devices and accessories - will express ship you a sample straight away. Compatible with PC, MAC with Bluetooth functions. When used with PC or MAC, the hotkeys will not function. How can I use this Keyboard with my PC or MAC? To use this keyboard with your PC or MAC, a Bluetooth Dongle is required. For detailed step by step guide, please visit this link: http://www.pcmag.com/article2/0,2817,2054228,00.asp#fbid=pKvZfvX8Ucx.